The System for Analysis, Research and Training (START), OML Center, Manila Observatory (MO), United States Global Change Research Program, National Science Foundation (NSF), Asia Pacific Network (APN), Integrated Research on Disaster Risk (IRDR), Kyoto University, and National Science and Technology Center for Disaster Reduction (NCDR) launched the 2014 Pan-Asia Risk Reduction (PARR) Fellowship Program last July 24-25, 2015 in an Inception Meeting at Marco Polo Hotel, Pasig City, Philippines. With the theme Urban Disaster Risk and Vulnerability Under Global Environmental Change, the Program combines the PARR Research and Practice-Policy Fellows into two-person teams for a six-month Fellowship experience, including one-month at a Host Institution. 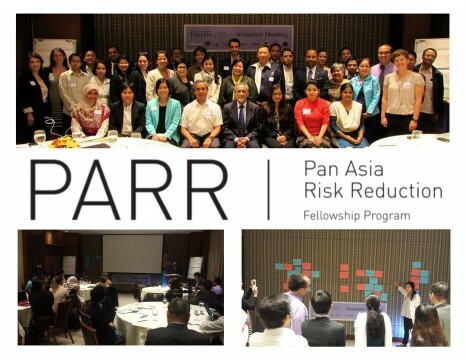 The Inception meeting brought together PARR alliance and fellows and their host and home institutions to share their expectations and perspectives and discuss issues of disaster risk reduction in urban areas. The meeting served as an opportunity to expose the first set of PARR Fellows to the larger community gathered in Manila and to foster collaboration amongst themselves and with representatives of the host and home institutions. The 1st day of the Meeting graced sessions on capacity building needs in disaster risk reduction and management; avenues for collaboration between PARR Fellowship Program consortium and regional donors; implementing the PARR Fellowship Program; and challenges and opportunities for science-policy-practice nexus in disaster risk Reduction and disaster risk management. The 2nd day included small meetings among host, home and fellows and a field trip in Greater Manila.